The air at the edge of the sea spit with fury as lava made its way down the island slope. Houses were run over in slow motion by unstoppable tons of hot melted rock. Gases and large lumps of lava were spewed into the air. You may have seen this on the news; the world watched last summer as Hawaii’s Big Island experienced the eruption of the Kilauea volcano. The lava slowly covered towns; residents had to flee. This grand Earth event might seem terrible, and yet, the Psalmist says that God touches mountains and they tremble and smoke. As in many other environmental changes, God uses natural processes to raise up new lands and fertilize soil. Across the horizon lay other islands in the chain. As the ancient crust of the Earth moved over one particular hot spot in the Earth’s mantle, these islands rose out of the sea one by one, volcanoes spewing lava and ash. As the eons passed, life settled on these distant shores, and plants and animals became adapted to these rugged places. The volcanic rocks, full of minerals, trapped airborne dirt, collected soil and became fertile ground for mosses, grasses and later the trees that would provide habitat for a myriad of birds and other animals. These islands are home to a large number of native species, including some 800 species of flies in the family Drosophilidae (the family that includes fruit flies)! Our God is unchangeable in his love, his commitment to his covenant, his purity and his greatness, as we see in James 1:17. As you might suspect, he also apparently likes amazing variation. The Earth he made and delights in is an exciting place of deep time and both fast and slow changes. Seasons come and go—annual changes, created by God and caused by the tilt of the Earth as it journeys around the sun. Tides come and go in rhythmic and predictable daily and monthly cycles. God calls the mountains to rise, the seasons to ebb and flow, the waters to flood and the land to dry; his nature is constant, but his creation is dynamic and exciting. With the Psalmist, let us praise God for both the changes we see in the world around us, and his own unchangeable nature! Dr. Dorothy Boorse joined Gordon College in 1999, and has worked to bring a greater understanding of the complex interactions among wildlife and the environment to the Gordon community and the wider world. 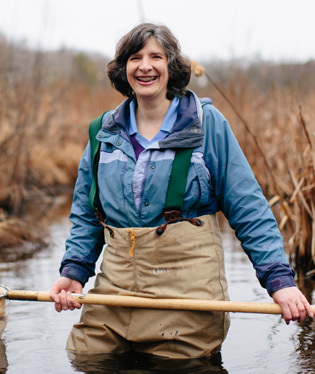 Her primary research interests are in aquatic community ecology and invasive species. Dorothy also spends a great deal of time studying the integration of faith and science, particularly in the realm of environmental ethics. In the past several years, her time has been devoted to authoring a major environmental science textbook.